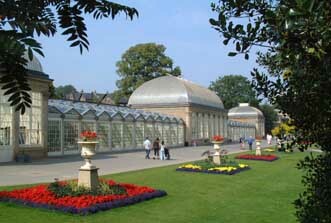 The Botanical Gardens are located just one mile from Sheffield City centre. They were first opened to the public in 1836 and were designed by Robert Marnock in the Gardenesque style. Many of the existing buildings were created at this time including the Pavilions, Gatehouse and Bear Pit. In fact, the gardens were initially opened as both zoological and botanical gardens and included animals, as well as plants, from around the world. Public admission to the gardens was limited to four gala days each year. In the 1890s, the gardens were in financial difficulty. There was competition from free city parks and attendances were falling. They were finally purchased by the Sheffield Town Trust in 1898 who made the gardens free for everyone. The gardens thrived again until the 1940s when the Town Trust were unable to repair extensive damage. In 1951, the gardens were offered to the City Corporation, latterly Sheffield City Council, for a peppercorn rent. This arrangement is till in place today; although the City Council manages the gardens, the Sheffield Town Trust own them. The gardens then went through further boom years. An aviary and aquarium were created in two of the pavilions and are remembered fondly by visitors to this day. An education unit was also set up, supplying plants to schools across the city. Unfortunately, in the 1980s and early 1990s, the gardens again went into decline. Staff reductions led to the gardens becoming overgrown and they began to look neglected. The Friends of the Botanical Gardens (FOBS) were formed in 1984, and campaigned for the gardens. In 1993, they were allowed to assist with the maintenance of the gardens and finally in 1996, in partnership with the City Council, Sheffield Town Trust, the University of Sheffield and the newly formed Sheffield Botanical Gardens Trust (SBGT), were successful in an application for Lottery funding. The following decade saw the gardens restored. Over £1 million was raised by FOBS and SBGT to add to the lottery grant, allowing the complete restoration of the gardens’ features and plantings. By far the largest element was the restoration of the glass pavilions. The roofs contain over 18,000 panes of glass, each hand-made, and the now house plants from temperate regions of the world. Each area of the gardens has a horticultural, botanical, geographical or educational theme, allowing the gardens to be used as an educational resource as well as for recreation. Areas include: Asia garden; Mediterranean climate garden; Four seasons garden; and an evolution garden. The plant collections boast over 4000 different types of plant from all over the world and this number is constantly rising. Even though the restoration was completed in 2005, the gardens continue to develop. Additional plantings are added and new areas developed. Today, the gardens are still managed as a partnership between the City Council, FOBS and SBGT. Visitors come from all over the country to enjoy the botanical delights housed in their 19 acres (7.7 hectares). The gardens are open from 8am, Monday to Friday and from 10am at weekends and on bank holidays. They close at 4pm in the winter and dusk or 7.45pm in the summer. A range of events takes place throughout the year, including theatre productions, music concerts, art shows and plant sales. For more information, visit the Gardens’ website www.sbg.org.uk, the Friends’ website www.fobssheffield.co.uk or telephone 0114 2686001. 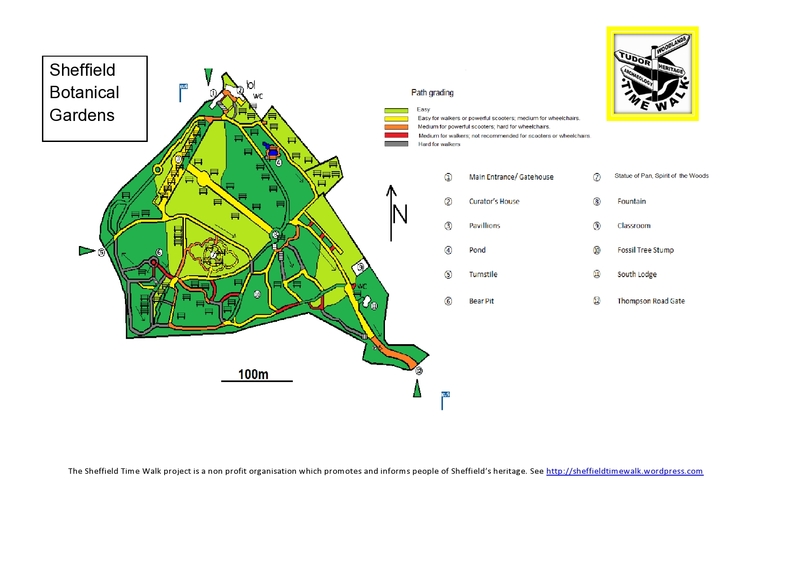 Timewalk Project has now added our new graded access map for the Botanical Gardens.